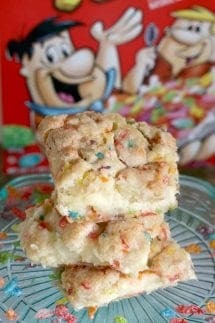 Fruity Pebbles Cookie Cheesecake Bars - 6 Ingredients and easy to make! These Fruity Pebbles Cookie Cheesecake Bars are not only fun to eat…they’re easy to make with only 6 simple ingredients! This ooey-gooey delight is made with a soft, chewy sugar cookie dough that’s LOADED with Fruity Pebbles and has a creamy, delicious cream cheese center. Trust me, your family will be begging for more! I am excited to be working with Post Pebbles as a Blogger Ambassador! 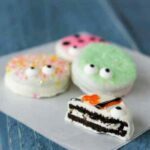 This blog post is sponsored by Post Pebbles, but all opinions are my own! Can we just talk about Fruity Pebbles for a minute? I don’t know about you but they just bring back memories of my childhood. So when their colorful box caught my eye at the grocery store, I picked up a box to see what kind of trouble I could get in in my kitchen. Deciding what to make was really a no-brainer. What better dessert than one that combines two of my favorite things: cookies and cheesecake! These Cheesecake Bars are an incredibly easy, delicious dessert takes no time to make and uses only six simple ingredients that you probably already have at home. To keep things even easier, this recipe uses refrigerated sugar cookie dough, but you can certainly use your favorite homemade sugar cookie recipe instead. 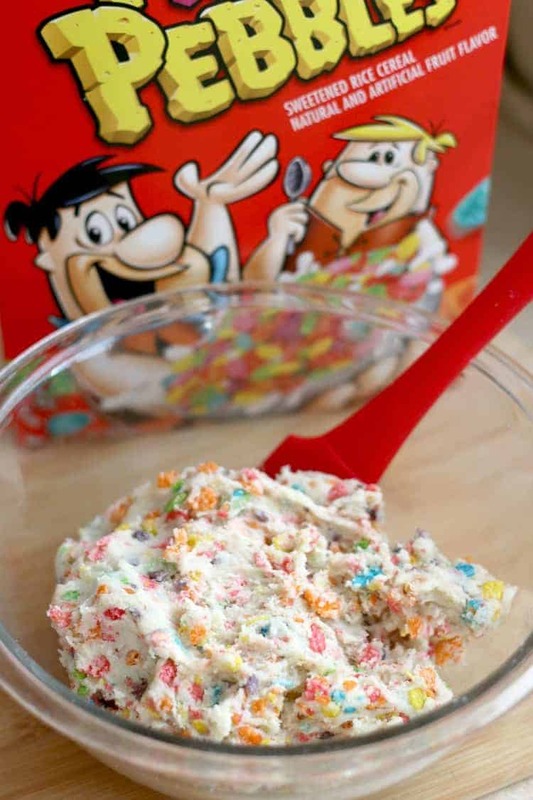 I love all the color Fruity these Pebbles add to the cookie dough; it’s the perfect pop of color. 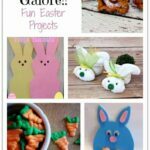 These cookie bars are a great idea for Easter, birthday party, picnic, or just for a special sweet treat for the family. 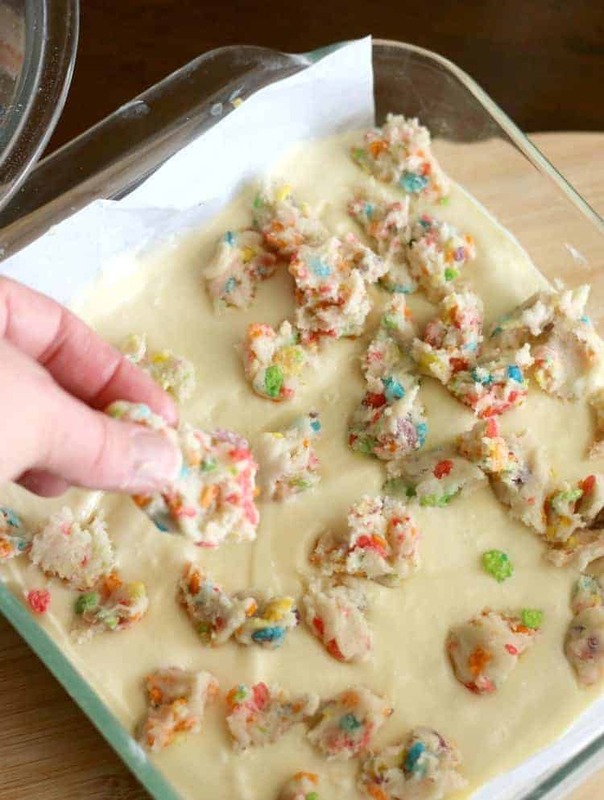 For these Easy Fruity Pebbles Cookie Cheesecake Bars, it’s helpful to let the cookie dough sit out for about 15 minutes to soften. 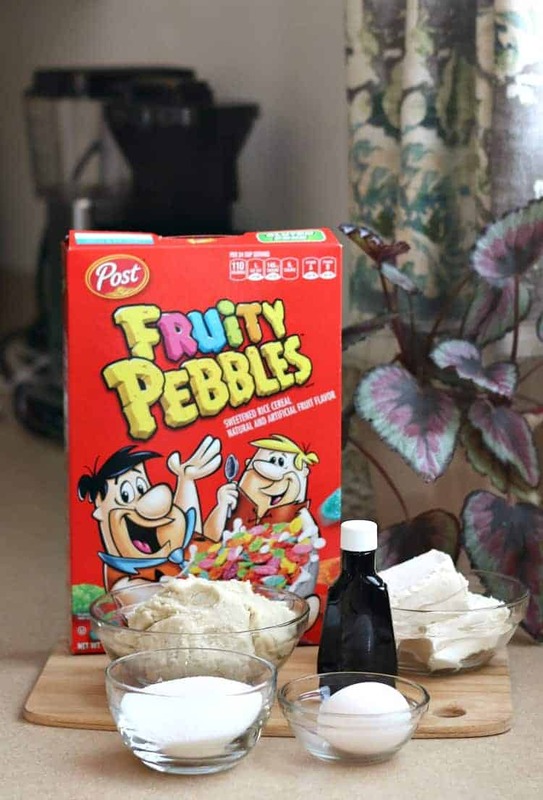 It will make it much easier to mix the Fruity Pebbles into the dough. I also like to put the dough in the refrigerator for about 15-20 minutes to firm it back up again. For the base layer of the cookie bar, take a little more than half of the cookie dough and press it into your lined baking pan. I like to line my baking pan with a piece of parchment paper because it makes removing the cookies bars a breeze. If you find the dough to be too tacky and sticking to your fingers, simply dip the tips of your fingers in a little bit of flour before pressing the dough into the baking pan. You can also place a piece of wax paper or parchment paper over the dough and then press. After forming the base cookie dough into the pan, it’s time to make and add the cheesecake filling on top. The cheesecake layer is just so smooth and creamy. To make the filling, all you need is some cream cheese, an egg, sugar and a little vanilla extract! To finish things off, crumble the remaining Fruity Pebble sugar cookie dough over the top of the cheesecake filling mixture. That’s it! Easy, right? After about 35 minutes in the oven, you are left with an amazing, super fun dessert the whole family will love. Be sure to let the bars cool completely before lifting from the pan. This gives the cheesecake filling addition time to set and makes sure that the bars will cut cleanly. Then, cut and serve and enjoy!! 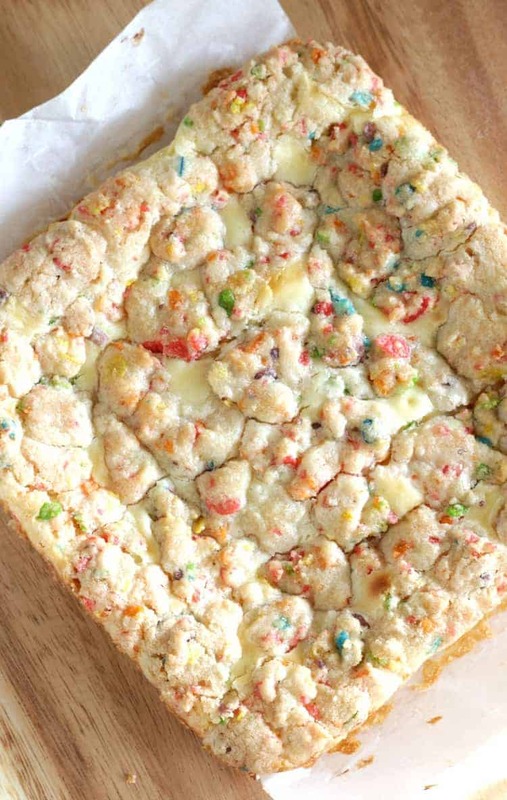 These Fruity Pebbles Cheesecake Bars are fun and delicious, and with 6 simple ingredients…it’s definitely a keeper in my recipe book! 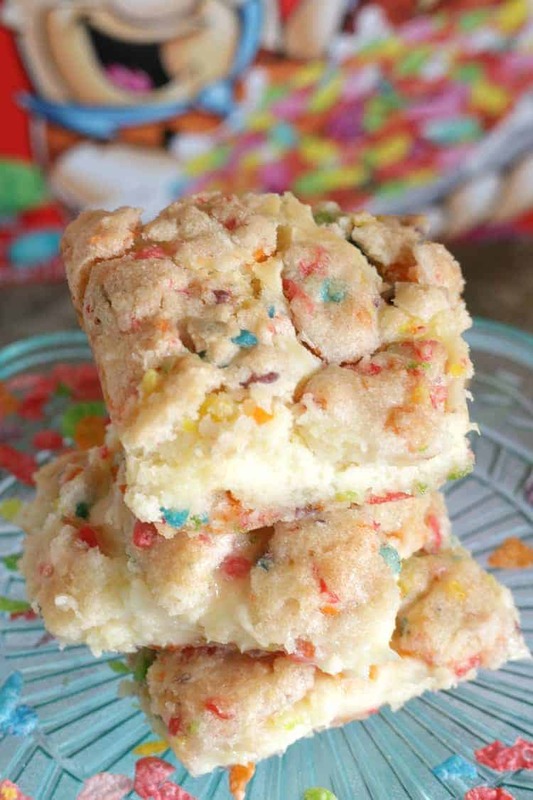 These Fruity Pebbles Cookie Cheesecake Bars are not only fun to eat…they’re easy to make with only 6 simple ingredients! This ooey-gooey delight is made with a soft, chewy sugar cookie dough that’s LOADED with Fruity Pebbles and has a creamy, delicious cream cheese center. 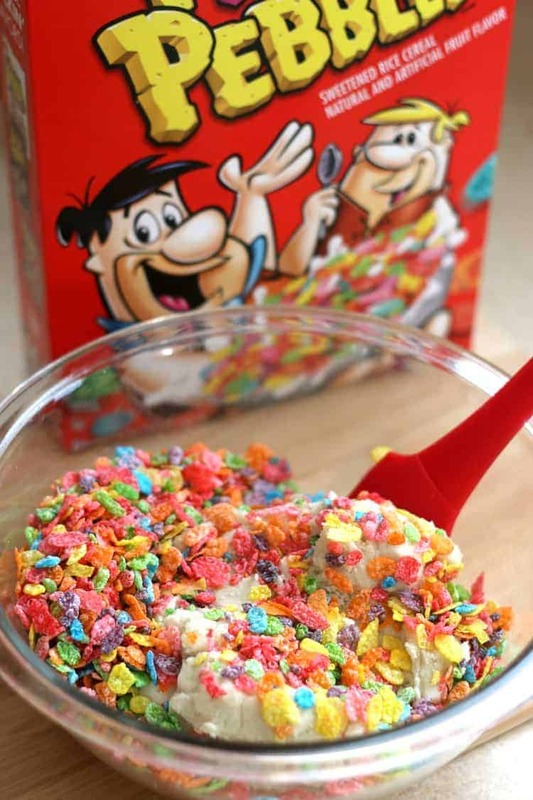 In a medium bowl, combine softened cookie dough and Fruity Pebbles. 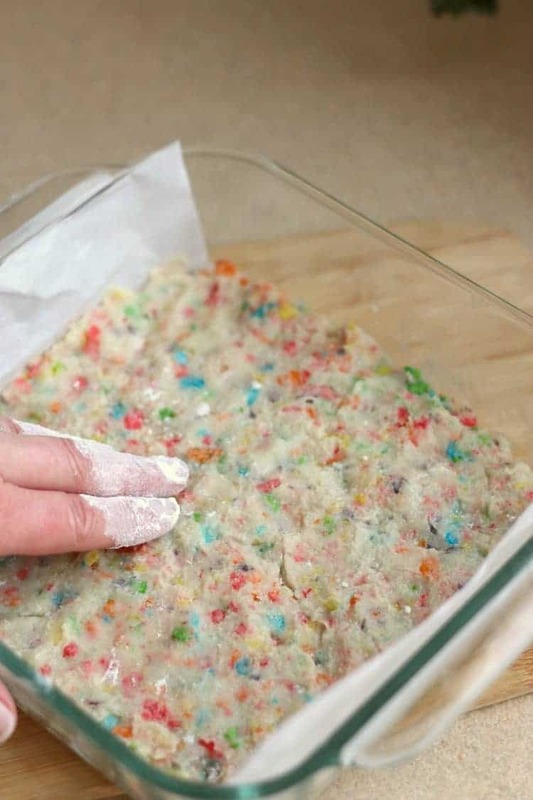 Using a hand held mixer, beat cookie dough and Fruity Pebbles until thoroughly combined. Spread a little over half of the sugar cookie dough onto the bottom of the lined baking dish. Press down to create an even layer. In a separate bowl, beat the cream cheese using a hand held mixer, until light and fluffy. 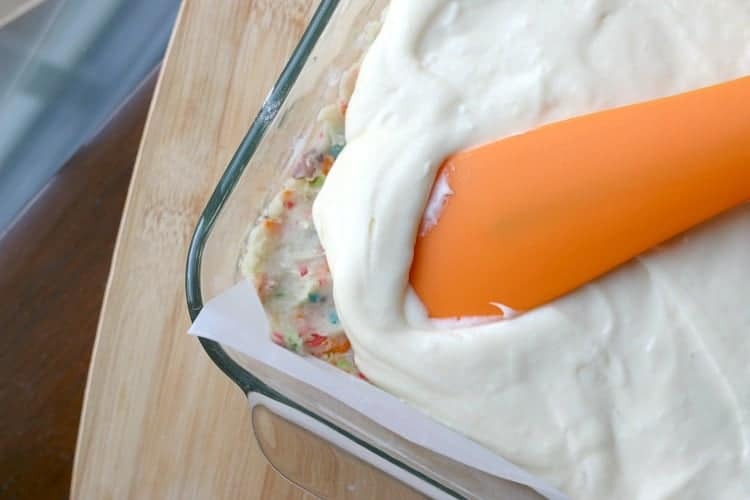 Pour the cheesecake filling over the top of the Fruity Pebble sugar cookie dough base. Take the remaining Fruity Pebble sugar cookie dough and crumble over top. Store in refrigerator in an air-tight container.